Global Truss America has unveiled the Truss Catalog Rack, as display stand constructed entirely of sleek and stylish truss.The eye-catching and corrosion-resistant Truss Catalog Rack is made from the same tough aluminum alloy used on Global Truss' hot-selling line of lightweight stage trussing. 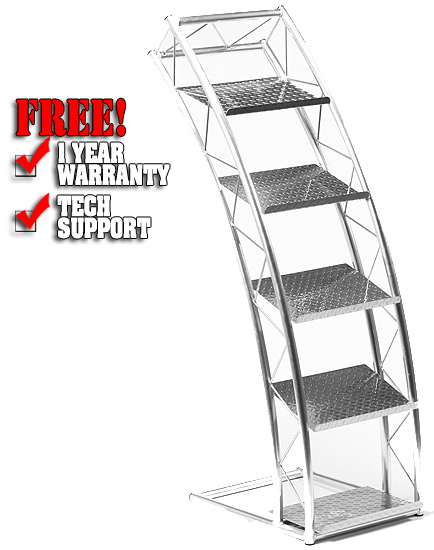 Sporting an edgy, modern design, the Truss Catalog Rack offers five tiers of display trays that let merchants present all kinds of printed materials in the best possible light. "Our new Truss Catalog Rack combines the sturdy construction of truss with a high-tech look that's sure to turn a lot of heads," declared Kenneth Kahn, general manager of Global Truss America. "It's durable enough to hold up for decades, and since it's made of aluminum, the rack is easily transportable to trade shows and around store display areas." Dimensions: 22.25"W x 74.4"H x 27.75"D Weight: 30 lbs.